Did you know that around 15 million root canals are performed every year? A root canal is a dental procedure intended to save a tooth that has become severely infected by removing bacteria and dead tissue. While root canals can be painful, they are necessary to prevent the need to extract an infected or decaying tooth. If you are concerned that you may need a root canal, it is important to act quickly. Keep an eye out for these ten signs to see if it is time to make an appointment with a dentist. Before we start looking at signs and symptoms to determine if you need a root canal, let’s step back and review what the procedure is and how it works. This will help you understand the purpose of a root canal, and how it can relieve your symptoms. Typically, a root canal becomes necessary as the result of a severe infection. This can be caused either by trauma to the tooth or by an untreated cavity. Often, the nerve in the tooth has become impacted by this point which can cause extreme pain. During the procedure, the dentist opens up the infected tooth and cleans out all of the decaying tissue, called “pulp.” The dentist will also use antibacterial medication to kill any remaining bacteria. After the procedure, the dentist will replace the top of the tooth with a crown to prevent future infections. When a tooth becomes infected, you may experience a sudden onset of extreme pain and sensitivity. This pain is often associated with a specific tooth, rather than with several teeth. The discomfort you experience may feel like a sharp pain or like a dull ache. The pain will likely also be worse when you touch the tooth. Another key sign that you need a root canal is pain that is made worse by chewing. As with a cavity, you may experience worse pain when eating foods high in sugar. If you only feel slight pain when you chew, this might not be a problem. Pain is more a cause for concern if it is persistent and then becomes worse when eating. Since tooth decay and infection can often affect the nerve at the center of the tooth, another common sign that you need a root canal is sensitivity to hot and cold temperature. Beverages like hot coffee or cold soda may cause discomfort to your tooth. Again, pay attention to whether the discomfort is for all of your teeth or one tooth specifically. If all of your teeth are sensitive, you may simply have sensitive teeth. If a specific tooth is experiencing pain, it may be a sign of a worse problem. Once a tooth becomes infected, the infection can travel and begin affecting other parts of the mouth. You may notice that the gum around the affected tooth is swollen, tender, or red. Once the gum starts experiencing symptoms from the tooth infection, it can begin to become infected itself. An infected gum may have pus-filled blisters or canker sores. It will also bleed during brushing. Discoloration can be another sign of tooth decay or infection. If a tooth starts becoming browner than the teeth surrounding it, or has a dark spot on it, this can be a sign that there is a problem. Just about any infection can cause swelling of your lymph nodes as your immune system begins responding to the infection. If you think you have an infected tooth, check the lymph nodes on your neck to see if they are large and tender. In some cases, a tooth infection can be a result of a chip or a break on a tooth. This is because once a tooth is broken, it is easier for bacteria to get to the soft tissue of the tooth. If you have a tooth that already has a chip in it, keep in mind that this tooth is at risk of infection. A dentist may be able to repair the chip, which can prevent infection and decay from taking place to begin with. As with a tooth chip, sometimes tooth decay can be brought on by trauma to the mouth. If you have an injury to your mouth or head area, make sure to monitor your teeth as you recover for signs of a tooth decay. If you begin experiencing any of the above symptoms after having an injury to the mouth, make sure to check in with your dentist. 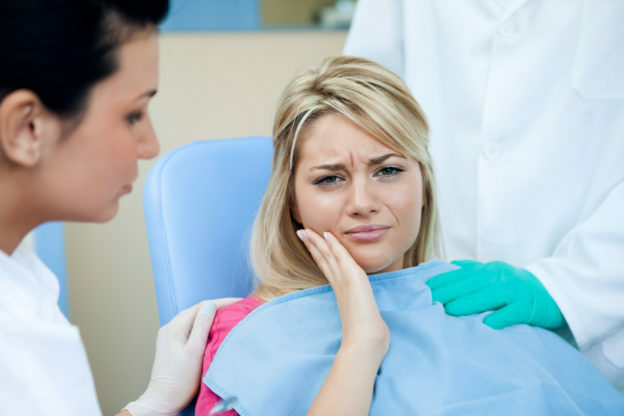 In most cases, a tooth that has become infected will have noticeable symptoms. The pain associated with infected teeth can be extremely severe. This often prompts sufferers to seek out a dental appointment. In other cases, however, you may have a tooth that becomes infected that does not show any symptoms at all. If the tooth is infected, but does not reach the nerve, you may not have pain or sensitivity. Because of this, it is important to always go to regularly scheduled dental appointments. That’s because the only other way to catch an infected tooth if there are no symptoms is through an x-ray. By getting your dental x-rays once a year, your dentist will be able to determine if you are starting to experience tooth decay and if you are at risk of needing a root canal. On that note, if you begin experiencing the tooth pain described above, that may indicate that your tooth has already been infected for some time. For this reason, it is important to make an appointment as soon as you start experiencing pain so it can be treated. If you have begun to notice one or more of these ten signs, then it is a good idea to see a dentist to have your tooth evaluated. Contact us today to schedule an appointment and get the treatment you need. This entry was posted in General Dentistry and tagged cracked tooth, dentist chicago, root canal, root canal dentist chicago, tooth pain on February 26, 2018 by Dr. Laurie Schumacher. Laurie Schumacher is a graduate of Loyola University with a bachelor’s degree in Biology. She attended New York University College of Dentistry, graduating with a Doctor of Dental Surgery degree in 2004. Upon graduation, Dr. Schumacher practiced dentistry in Orland Park, Illinois, for five years, before relocating to Chicago. Since graduation from dental school she strives to keep up with the latest techniques and tools to provide the best dental care for her patients. Dr. Schumacher attends numerous continuing education courses and is involved in various dental organizations. Dr. Schumacher is an active member of the American Dental Association, the Illinois State Dental Society, and the Chicago Dental Society. In 2010 Dr. Schumacher completed LVI’s Advanced Functional Dentistry program. She is Invisalign certified.